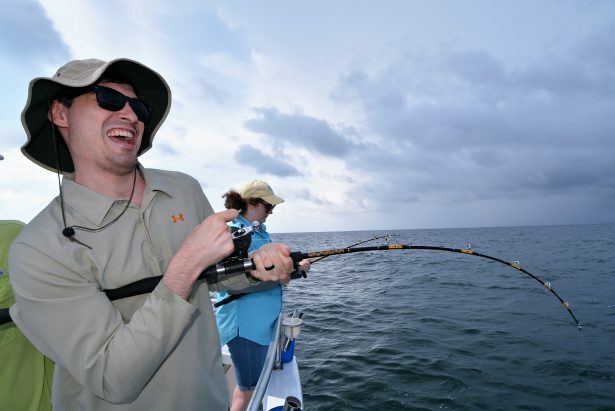 Trolling fishing offers first time anglers an opportunity to see what a well rounded fishing charter should be like. If you are like most people who have never been deep sea fishing on a charter boat before, you have no idea about what to expect. If you have been on a charter boat before and think all charters are the same, come let us show you how good you will be treated when you give us a chance to serve your family. We care more about you getting a good experience, keeping your poles bent and will be treated like one of our family. No matter what you might think or have heard or experienced in the past, the personality of your captain and crew has a huge effect on how good a time you will have on a fishing charter. Choosing the right captain and crew is crucial in you having a good experience. Our captain and crew are very respectful, “G” rated, non smoking, happy, fun, personable, joking, knowledgeable, social, interacting, caring and helpful. Captain Troy and his deckhand Corey are all those things, and even more. Our reputation depends on us being that way. Troy (that’s me – has a very outgoing personality) I am happy to get to meet you and your family for the first time as well as enjoy seeing old friends. I am up beat, optimistic, joking and have a lot of laughter when you arrive on the dock, during your trip and until you depart on your way home. I have a sense of humor that is comical, fun loving, story filled and most of all, kind, understanding, loving and gentle. I love kids with special needs and enjoy being with them. If you have shy children, it is my job to get them out of their shell and encourage them to engage some how. I love kids. We don’t push anyone of your kids to join in. We encourage them, Lead Them and help them build confidence. First time anglers also wonder about the charter boat and the tackle they will be using. They wonder if it’s clean or if the cabin has air conditioning and a CLEAN inside bathroom. Yes, our boat is clean and so is our restroom. All our tackle is well maintained, clean and a lot of it is new. We rotate a lot of our rods and reels out with new ones each year, so we don’t have to pay for all new ones at once. We always keep spares, in case something malfunctions, breaks or something weird or out of our control happens. We get just as excited as you and your family does. That is why we promise we will do all we can to make your dreams come true and provide you with a trip that is as exciting as your imagination is telling you it will be. We love our customers and we interact with you constantly, making sure you are OK and everyone is happy. We don’t cut corners or waste time. We take you to where the fish are and give you a chance to learn how to catch them. I will attempt to explain how we do things on the Distraction, so you can relax, participate, enjoy and absorb this whole charter fishing experience. If you would like additional information, please visit our frequently asked questions page. We also have a charter fishing policies page that gives you a lot of information pertinent to your trip. 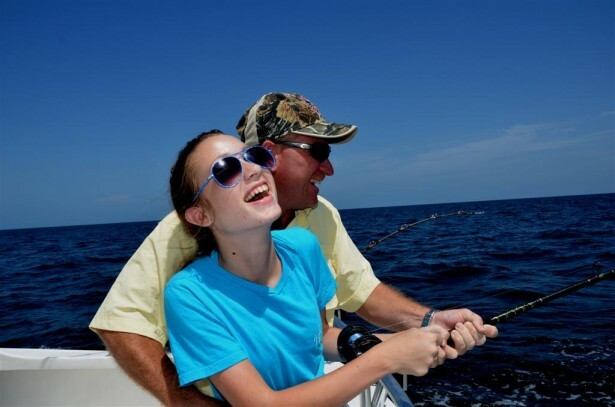 Remember, we are family fishermen, conservationists and sportsmen who know how to give you the perfect combination of great service and good fishing. Triggerfish are fun to catch. They are usually in season during the spring months of March to May. We have done a good job over the years, carefully explaining what you can expect to catch and possibly keep. We do this so no one is confused or expects to receive more than we or anyone can offer. There are a lot of factors that go into your catching and or keeping a few for for dinner. Participation of your family members plays a key role in your production. Often we have 4, 5 or 6 people on board and not everyone wants to fish at the same time. We usually have 1, 2 or 3 people who don’t want to fish at first, but join in later. When they decide to engage, they spend a little time learning how to hold their pole and trying to catch a fish. From experience, the more people you have participating in your group, the more bait you have in the water, the better chance you have to catch a fish. The fishing seasons or the time of year you are in town play a huge role in your catching any fish to keep. 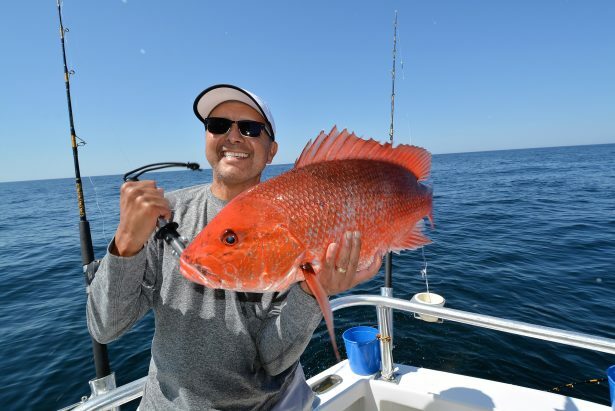 Summer season (June 1 to the 1st day of August) is red snapper season. You may keep 2 per person and they must be 16″ minimum size. Most of the fish we catch on 6 hour trips range from 12″ to 16″ in length. Some are larger, but you need a little bit of luck to get them up to the boat without breaking off. 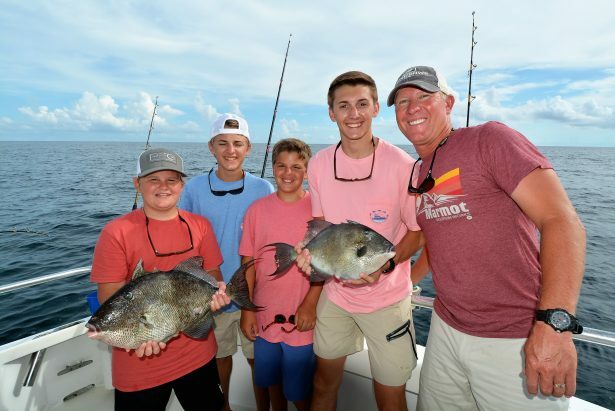 Triggerfish Season usually opens in March and remains open until the beginning of May each year. Greater Amberjack season opens August 1 and continues to the end of October each year. Amberjack trips are usually full day – because it takes that long to get far enough offshore to get tow where they live. We also catch some vermilion snapper (beeliners) during the spring and fall each year, but they are smaller than most of the fish we catch. The good thing is, they are available year round to harvest. These four reef fish species are the most common fish we catch. During the summer, we do catch some migratory fish like mackerel, but that depends greatly on water clarity and quality. The 6 hour trip is our best trip and gives you a chance to catch a few for dinner (as long as they are in season). The full day trip is the best trip we offer if you want a chance to catch a bigger fish, that pulls hard and tastes good. We fish when it is raining. We just do our best to stay away from thunder storms. We prefer to fish when the sun is shining and the water is calm. No matter the condition, we will put your happiness and safety before our personal gain. That’s a promise! Almost every day during the summer months of May to August, there are thunderstorms and a chance of rain. We want the weather to be good on your trip, but 50% of the time, perfect sea conditions do exist. To us, perfect conditions means 1-2 feet seas or less with sunshine and a gentle breeze. It’s the other 50% of the time where we exercise a little more caution and a lot of communication with our guests. If the weather and sea conditions are forecast to be good or safe (including rain), you will be expected to show up for your fishing trip at the predetermined departure time. If conditions are not safe or are rough, I will do my best to get in touch with you beforehand or try and save you a trip to the marina or offer you another time to go (if we have availability). We generally go fishing if seas are 3′ or less and if it is raining or thunder showers. If seas are larger or if rain is sopped in, I will be contacting you as soon as I know that information to discuss possible options. We often get questions and comments like “It is supposed to rain tomorrow or next week, are we going to be able to go fishing?” The answer is most likely “Yes” unless seas are forecast to be rough. We don’t look at the same weather forecast that you do. We look at a marine forecast. 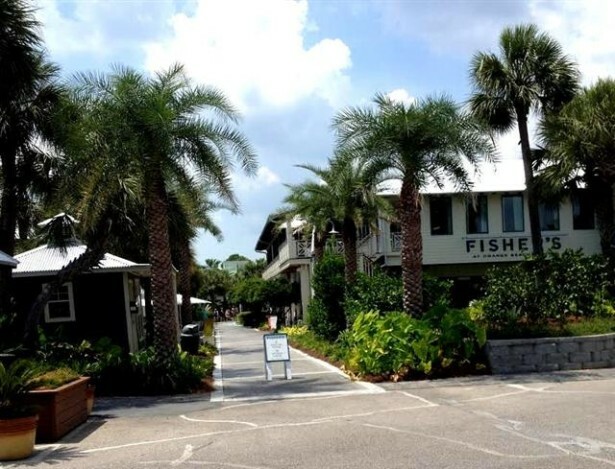 We look at the “Coastal Waters from Pensacola, Fl. to Pascagoula, Ms. out 20 nm forecast. You have to scroll down to the second report from the bottom. We also use the windfinder app and use the Orange Beach Sea Buoy located 12 nm south of Perdido Pass. The best advice I can give is, Trust Me – I Don’t Want You To Have A Bad Weather Experience. However, we do fish in seas that are not calm. Just like an airline, we do operate when it is raining, wind is blowing and seas are not calm. We promise to do our best to keep you informed and up to date on all potential weather situations that may keep us from having a great experience. Walk down this path about 100 yards to the dock store. Our boat is on the left side of the store in the third slip. First off, you will be greeted by Captain Troy with Open Arms, Hand Shakes, Hugs and Laughter. If you are a shy or quiet person, don’t be alarmed. It’s just how we do things. Depending on what time of the day your fishing charter is scheduled to depart, please show up about 20 minutes early. If you have a morning trip scheduled, please come directly to the boat tied in the slip. If you are not going to arrive early, please send me a text, because we run a tight time schedule and we want to give you our best. If you are scheduled for an afternoon trip, please gather or meet us behind the Orange Beach Marina Dock Store in the sitting area that is shaded at least 20 minutes prior to your departure. By meeting us behind the store, allows us to get the morning passengers safely off the boat without crowding them. You will be greeted by me, “Captain Troy” with an introduction, hand shake, laughter, joking around and lots of smiles. You might even get a welcome hug – If I already know you. After we get you on board the charter boat and getting your belongings stowed away, the captain (That’s Me) will bring you all inside and we will go over a safety speech and briefing. This is where I laugh a whole lot and tell you about our procedures and explain how they developed over time. We will try to get you to relax a bit by sharing a few true funny stories that come from almost two decades of service. We don’t have rules, because rules are made to be broken. Instead, we have procedures or ways we do things. We communicate in gentle ways (often funny) and know how to keep people calm. If you have children family members with autism or special needs, we will do all we can to help keep them calm, so they don’t escalate. We are the calm boat and everyone is treated with respect and dignity. Safety – We will go over everything from walking around, holding on, coming upstairs, using our private restroom (you will remember how to use it when we get done explaining what not to do). We will touch on sea conditions to expect and an overall briefing about what the day should entail. Our job is not to stress you out. We calm fears and put smiles on faces, as well as bend the rods. Intent To Keep Fish or Release Fish – We will also be asking you to verify your intentions about keeping fish for dinner. (If you catch any that are legal) Often people check a box on the reservations form saying “keep a few” or “release them all.” Before we go catching a bunch of fish and putting them in the cooler, we just want to be responsible and ask you if you want to keep the fish. In the past, we have had customers say they want to keep fish and at the end of the day, they ask themselves “why did we keep so many fish?” If you don’t care about keeping any fish, now is the time to speak up and let us know your wishes. Now, this is not written in stone. If we get out there and we catch something special that is good to eat, we will ask you if you want to harvest it or not. The choice is yours. We just want to make sure we give you what you need for a few good meals. We often catch fish while heading offshore while trolling. Depending on the fish, we may pull lines slowly or fast behind the boat. After we start the engines, we will depart Orange Beach Marina and idle out and go beneath the Perdido Pass Bridge at Alabama Point and continue toward the jetties or the opening to the Gulf of Mexico. This ride takes about 20 to 25 minutes depending on tides and other boat traffic. Once we get to the end of the jetties, and depending on the length of trip you have chosen (6 hour or 10 hour), we will throttle her up to about 10 knots (11 mph)and begin heading toward the fishing grounds located some 10 to 50 miles offshore. On 6 hour trips, we usually ride for 1:45 minutes to 2 hours offshore before we stop and start fishing over artificial reefs. During the summer months and if the trolling fish are biting and available to catch, we might slow troll for a little while in hopes of catching some mackerel for dinner/supper. If you do not want any fish to eat, please let us know before we start fishing, so we can be prepared to release them. If you have chosen the shorter 6 hour trip, we usually do not stop near the pass/jetties to catch live bait. This takes up to 30 minutes of your time that we feel would be better spent by giving your more fishing time on the reefs. If we ever do stop to catch live bait, we won’t be spending too much time doing it. We keep plenty of cut bait on board to get us through the entire fishing trip. If you have chosen the longer, full day (10 hour) trip, we may stop just outside the pass and try and catch some live bait. Since we have all day to fish, we can spend a few more minutes catching some live bait. Sometimes we have bait traps set, so we don’t have to spend time catching live bait. Having live bait on full day trips gives us an opportunity to fish using different techniques so we can target different species that might not be available on shorter 6 hour trips. Pole bending, constant action for our guests is the goal on every fishing trip. When we arrive at the fishing spot or artificial reef, I will stop the boat and aim the nose of the vessel into the wind and try to figure out what we call the “hold up.” Because we don’t drop anchor, we try and hover the boat over the reef so you can drop down and catch the fish beneath the boat. Holding the boat into the current and wind allows me to keep the boat directly over the reef so you increase your chance of catching one. While I am figuring out the hold up, your deckhand will educate and demonstrate how to use our fishing gear. He will show you how the reels work, how to bait your hook, instruct you on how to hold your pole, how to let out and retrieve your line/bait and what to look for when the fish begin to bite. After that, he will ask how many of you want to try fishing. Some kids are small and can’t hold a pole by themselves. We expect a parent to assist them until they get the hang of it or until they are no longer interested. The deckhands job is to help you, not do it for you. However, our deckhand is really kind and gentle with family members who may be a little shy or don’t want to try fishing. Our goal is to get them out of their shell and help them learn a new skill that will hopefully build their confidence. While you are fishing, I will do my best to come downstairs and take pictures of your family members while fishing. I also like to get pictures of everyone holding live fish (while the fish look their best). You will appreciate the pictures I take. They are professional grade and large formats. Red Snapper wiggle when you take their picture. 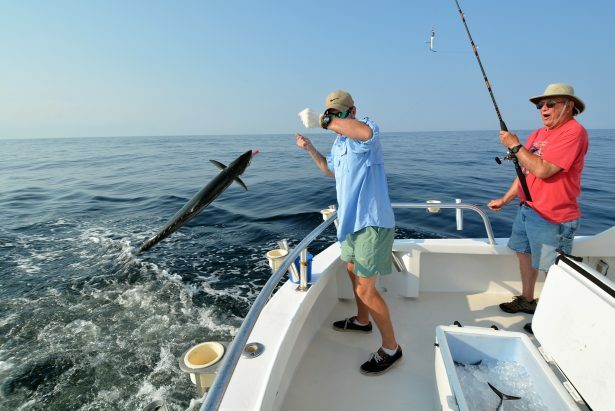 Depending on the time of the year, we troll for fish like king mackerel, spanish mackerel, bonito, jack crevalle, hard tails (blue runner), lady fish (poor man’s tarpon), blue fish or any other species that are migratory. This may include mahi mahi (dolphin fish), wahoo (ono), blackfin tuna, etc. The species you may catch depend on the time of the year, length of trip chosen, water clarity, rip currents, tide lines, distance offshore, sea conditions, etc. As you can see, there are many different scenarios for trolling fish. On half day trips, be prepared to target the first four or five species listed above while trolling. Most of them are very tasty as long as they are younger fish. Size of The Fish We Deem “Quality fish” – Most red snapper we catch on 6 hour trips or less are a couple of pounds each to 4 pounds. They have to be 16″ minimum to keep them. Some are larger, some are smaller. Catching them depends on many factors, but the most important one is your participation. The king mackerel we catch have to be 24″ in order to keep. The best ones are 24″ to 29″ in length. Larger ones are not near as good to eat. 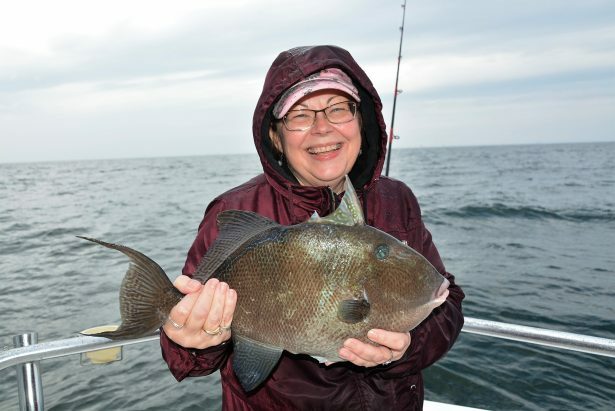 Triggerfish must be 15″ fork length to keep. They are very good to eat. Bottom fishing is not always fishing on the bottom of the sea floor. This is what we call deep sea fishing though. This is done when everyone holds a pole and drops their bait beneath the boat while I am holding the boat over the reef. 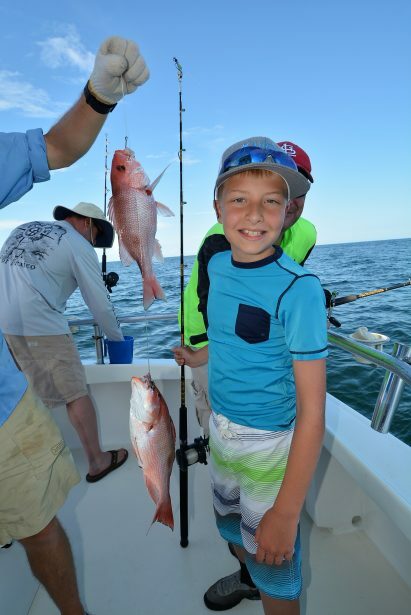 This type of fishing produces popular species like red snapper, triggerfish, vermilion snapper, lane snapper, grouper, sea robins, ruby lips, red porgy, grass porgy, jolthead porgy, almaco jacks and greater amberjack. Most of these species are highly regulated and have short seasons and low bag limits. If you want to book a trip to harvest these fish, you need to ask beforehand to see what is in season during the time of your visit or trip. Sometimes you can catch two fish at a time! Any fish that are kept, the deckhand will place them in the cooler and ice them down. They will be removed for photos and or cleaning after we return to the dock. The ride home on most 6 hour trips is about 2 hours. That is because we usually start fishing closer to shore and end up at our farthest point. When time is up, everyone will reel up their lines and your deckhand will help you stow your gear properly. On the ride home, your deckhand will be cleaning the boat, tackle and the back deck. We ask that you be courteous and step inside during parts of his washing so you don’t get a bath yourself. After he gets things clean, he will signal to you that it is ok to come back outside. It is important to keep the boat clean for you and for the next group that comes on board after you. Most of the time, once people get inside that air conditioned cabin after an exhausting fishing trip, they fall asleep or take naps. We strive to give you the cleanest boat and want you to appreciate having a clean place to relax. When we pull back into the marina, we will back the boat in the slip. We ask that you keep your hands inside the boat and do not reach out and touch anything. This way, nobody will get their hands pinched. Your mate will tie the boat up, grab the portable steps and prepare the boat for your departure. We will help you get off the boat and your stuff off the boat and on to the dock. If you have kept any fish for dinner, the deckhand will then take them to the cleaning station and begin processing your catch. He will give the fillets to you in a storage bag. Remember, he cleans your fish at no extra charge. When he finishes, this is the time you need to pay him the cash deckhand fee and tip. He will thank you for your business.